The topic of climbing chalk can get personal very quickly—what form of chalk do you like—liquid, powder or block chalk? How fine or gritty do you like it? 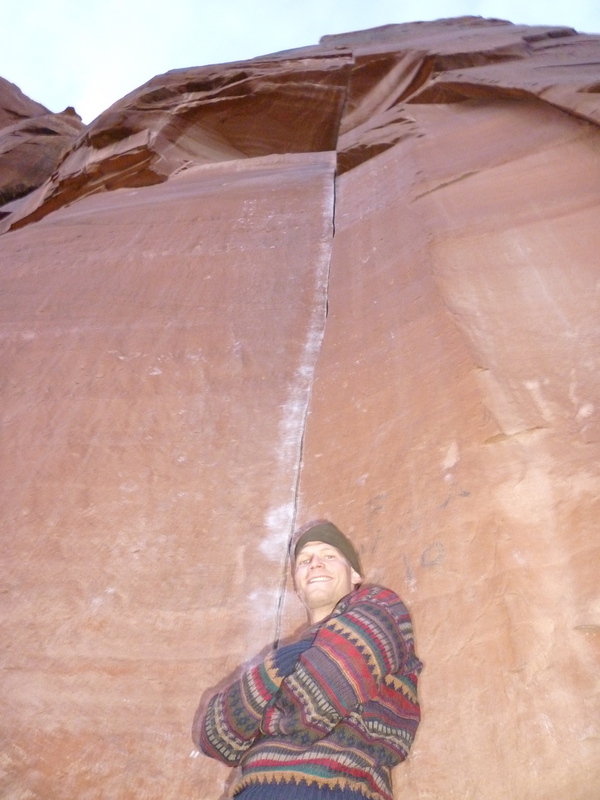 How much of it do you need to feel secure while clinging to a rock face? Should people even use chalk at all? 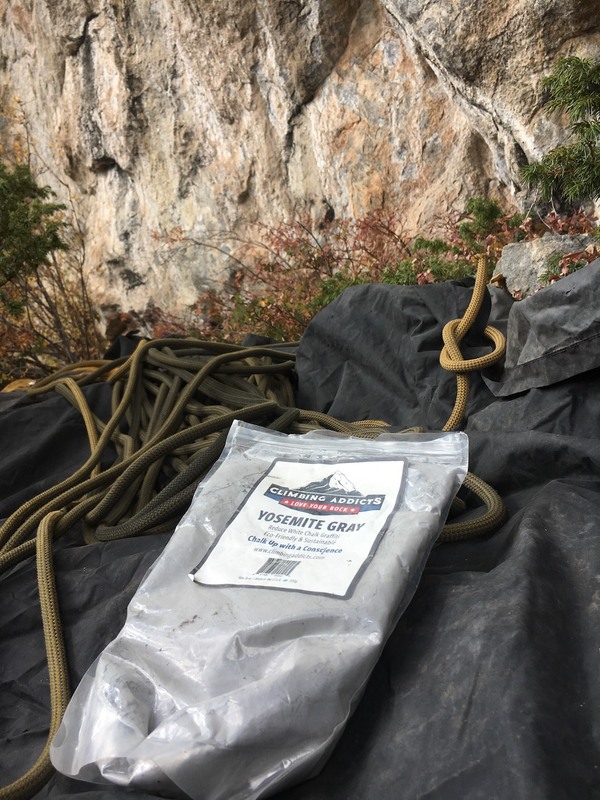 The classic white powder—a compound of magnesium carbonate—was originally used by gymnasts and is specifically designed to dry sweaty hands, thus improving a climber's grip on the rock. But every body is different. Some hands sweat more than others, and everyone who uses chalk likely has some psychological reasoning behind how and why they use it, and why they may prefer a particular brand or type of chalk. To feel secure, some people need to have a bag full of powder into which they can plunge their hands all the way up to their wrists at every opportunity; others get by with an occasional dip that barely dusts their fingertips. I know quite a few climbers who have strong opinions about what kind of climbing chalk works best for them. There are many varieties with different textures and appearances. There is even liquid chalk, and I know more than one climber who uses liquid in conjunction with powder chalk for maximum effect. An obvious problem with the prevalent use of chalk, especially now that there are more climbers than ever, is that popular boulders and cliffs all over the world are increasingly dotted or streaked with white gunk. In response, there have been a few offerings of rock-colored chalk on the market through the years. This chalk is designed to blend in with the cliff so that our handprints are less evident. The common complaint about camouflaged chalk is that it generally has a very fine, powdery or dusty feel on the skin compared to other types of chalk, which are usually a little crunchy, with chunks that you have to squeeze to break apart. It's evident from the continued proliferation of white chalk marks everywhere that camouflaged chalk has yet to gain traction with consumers. 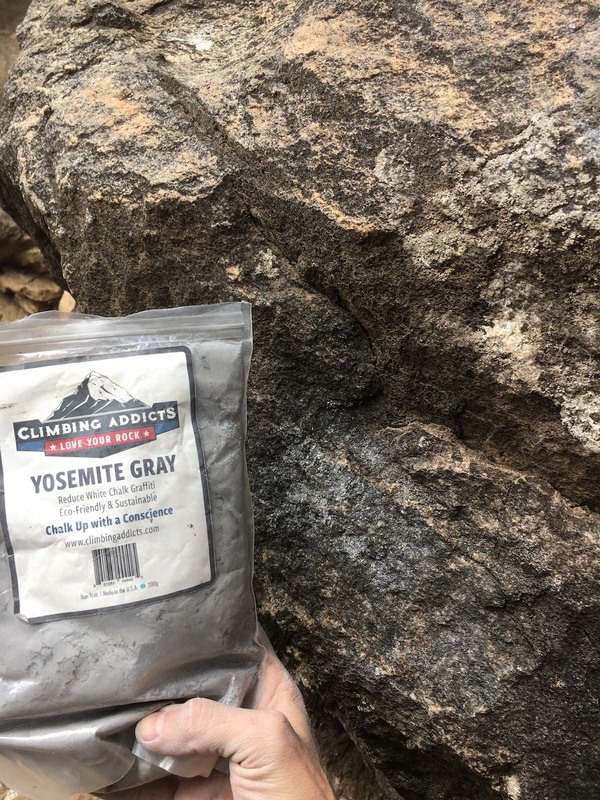 Climbing Addicts' "Yosemite Gray" and "Wall Street Gold" (which is brown; the name is in reference to a roadside cliff near Moab, Utah)—is the best rock-colored chalk I've sampled so far. But it does have that finer, more powdery feel described above. I'm a very moderate chalk user. I use a chalk ball to prevent excess material from spilling out of the bag, and I'm not one to pause for a dip on every move—more like a couple of dips when I find myself at good rest stances. I abhor liquid chalk, as it dries my skin too much to be healthy. But I've never felt like my hands are particularly sweaty to begin with. 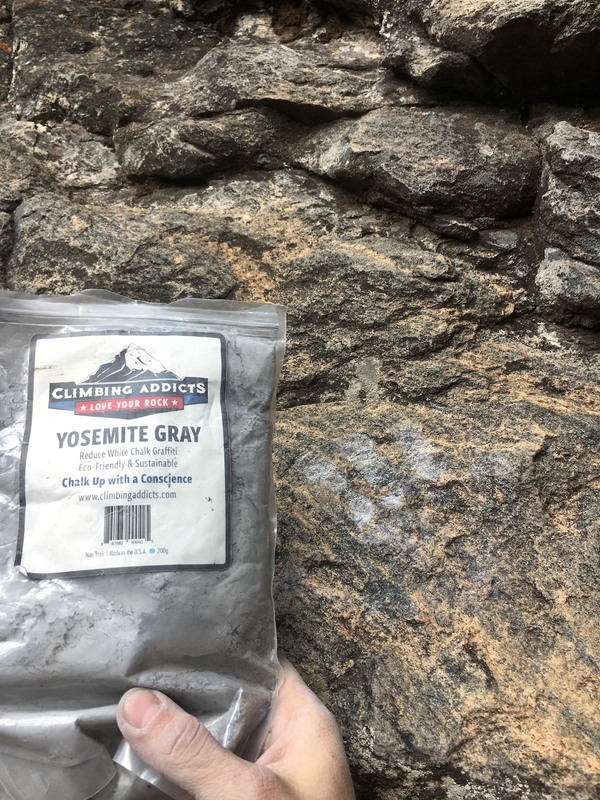 I've been using Climbing Addicts Yosemite Gray in my chalk ball since about April, and my skin has felt as dry as can be while climbing in conditions that range from early spring thaw to hot, summer monsoons, to perfect autumn temps. I haven't noticed a difference in chalk performance even though I'd previously used some of the fanciest, most expensive varieties on the market. But I do notice myself slapping my pant leg or clapping my hands more often to eliminate what feels like excess powder on my hands, which I attribute to the finer texture. For that reason, I think it is probably best to use this particular stuff with a chalk ball; I feel like way too much of it cakes onto my hands otherwise. Climbing Addicts is based in Colorado's Front Range, where Shawn Axelrod started the company with his two sons, who are still involved. The magnesium carbonate is sourced from Caffiers, France, but the final product is made in the USA. "I started climbing when I was 18 and I'm 50 now," Axelrod said, adding that he felt a greater responsibility to make a difference for future climbers when he introduced his sons to his lifelong passion. Climbing Addicts is currently donating 2 percent of all its sales to Leave No Trace. I can't help wondering if camouflaged chalk has a chance of ever taking hold—will enough climbers ever bother using it to make a difference? Will there ever be enough varieties and forms of rock-colored chalk to appeal to the myriad preferences of a mass audience? The pessimist in me strongly doubts this. Unless I'm climbing a first ascent or ascending a remote, rarely climbed cliff, my gray or brown chalk is a speck of dust in an ocean of white that has already been plastered to most of the routes I will ever touch. The very idea of changing the habits of generations of climbers who may view this as a trivial lost cause—of somehow dimming or reducing the ugly evidence of our long-held and widespread compulsion—is daunting. That is why I'm awarding five stars and giving a firm endorsement to Climbing Addicts. One by one, we just might make a difference, big or small...if we bother to try. 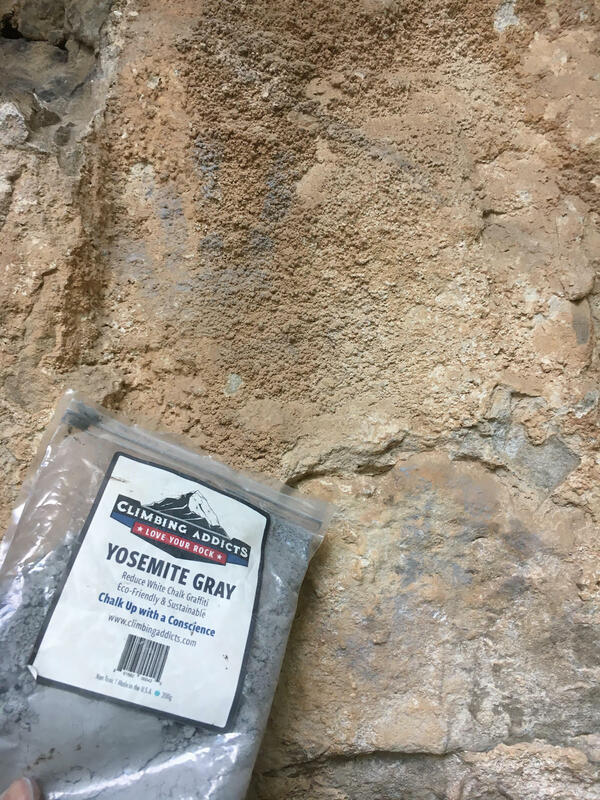 For more information about the history and industry of climbing chalk, see "The Hidden Environmental Cost of Climbing Chalk" by Bradley Allf, which appeared in a Spring 2018 issue of Climbing. Alpinist Digital Editor Derek Franz received his first chalk bag (and chalk ball) as a Christmas present when he was 11 years old in 1993.